To Cite: Mirzaei F, Khazaei M, Komaki A, Amiri I, Jalili C. Multitarget Effects of Coconut Oil (Virgin Type) on Aβ-Induced Alzheimer’s Disease Animal Model, Arch Neurosci. Online ahead of Print ; In Press(In Press):e85715. doi: 10.5812/ans.85715. Background: Almost 5% of people over 65 and 35% of those over 80 years of age have Alzheimer's disease (AD). Objectives: The current study evaluated the neuroprotective effects of virgin coconut oil (VCO) on amyloid beta (Aβ)-induced cell injury. Methods: The total phenolic content (TPC) and total flavonoid content (TFC), 1,1-diphenyl-2-picrylhydrazyl (DPPH) radical scavenging and total antioxidant activity were measured. Rats were randomly divided into six groups: control; sham; sham receiving normal saline; Alzheimer’s rats (received Aβ 1 - 40); Alzheimer’s rats + 8% VCO and Alzheimer’s rats + 10% VCO. After 8 weeks, the levels of TNF-α protein, TNF-α and iNOS gene expression in the hippocampus, the nitric oxide level, thiol group, catalase, superoxide dismutase (SOD) and glutathione peroxidase (GPx) activity were measured. The morphological changes in the regions of the hippocampus and Aβ plaque formation were determined. Phosphorylated tau proteins were also determined by immunohistochemistry. Results: VCO showed potential antiradical and antioxidant activity after in vitro treatment. VCO also significantly increased the thiol content, catalase, SOD and GPx activity and decreased the cholinesterase and nitric oxide levels. TNF-α and iNOS gene expression and protein levels decreased significantly after administration of VCO. Different areas of the hippocampus showed a significant change in the number of neurons in hippocampus, amount of phosphorylated tau and count of amyloid beta plaque in the Alzheimer’s rats that had been markedly restored by VCO. Conclusions: VCO showed neuroprotective effects in conjunction with various anti-Alzheimer’s medications (antioxidant, anti-inflammatory, cholinesterase inhibitors and reduced phosphorylated tau). Alzheimer’s is a multifactorial disorder that is affected by aging, genetic risk factors, reactive oxygen species and inflammation. Studies have shown that this disease initiates with synaptic loss, neuronal impairment, proliferation of microglial cells and is followed by inflammation (1, 2). The exact mechanism of Alzheimer’s disease (AD) is not completely understood; however, plaque deposition by fibrillar aggregates of amyloid beta peptide (Aβ) is recognized as a factor in the pathology of this disorder and is measured in AD pathogenesis (2, 3). It has been documented that inflammation induced by Aβ results in memory loss, oxidative stress and an increase in TNF-α (2, 3). Furthermore, increased oxidative stress in the brain is accompanied by memory and cognitive loss and development of AD (2). Elevated oxidative stress causes formation of senile plaque, amyloid deposits and synaptic loss that result in loss of the structure and function of neurons. One vital contributing factor for management and prevention of neurodegeneration is the control of inflammatory factors and oxidative stress (1, 2). Management of AD has focused on decreasing the formation of Aβ by normalizing cholinergic function with the administration of cholinesterase inhibitors, non-steroidal anti-inflammatory drugs and by reducing neuro-inflammation medications such as COX-2 inhibitors. Most of these medicines have side effects. In this context, natural herbal sources with beneficial health effects and few side effects can be a good alternative for the prevention or management of inflammation and oxidative stress in neurodegenerative diseases (1, 2). Virgin coconut oil (VCO) is useful edible oil that has been shown to influence inflammatory disorders. Vysakh et al. (4) showed that VCO significantly inhibits inflammatory mediators in chronic arthritis. This type of oil can normalize oxidative stress and inhibit lipid peroxidation (5). 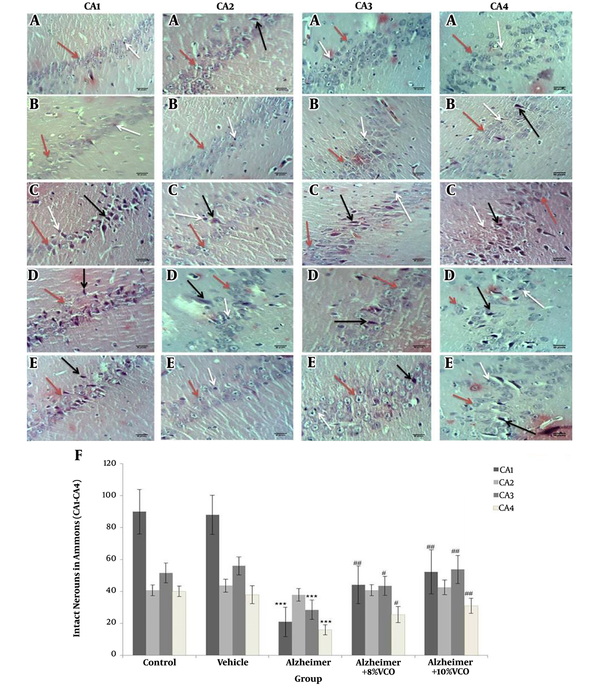 The current study investigated the neuroprotective properties of VCO in Aβ-induced Alzheimer’s rats as a potential antioxidant and anti-inflammatory agent. The antioxidant effects and TPC of VCO in the in vitro condition were determined as well. The VCO under study was produced according to the previous studies (6). The total phenolic content (TPC) in the VCO was measured with Folin-Ciocalteau reagent using a previously published method and Gallic acid as the standard (7). The total flavonoid content (TFC) content of the oil was measured using the AlCl3 colorimetric assay. Quercetin was used as the standard. This method was performed according to published recommendations using 1,1-diphenyl-2-picrylhydrazyl (DPPH) assay by adding 1 mL of 1 mM DPPH solution to 3 mL of VCO solution (in methanol; 25 - 100 mg/L. Butylated hydroxytoluene (BHT) was used as the reference (7). The ferric reducing antioxidant power (FRAP) was used to determine the total antioxidant activity of the method described previously with small modifications. FRAP is based on the ability of the antioxidant to reduce Fe3+ to Fe2+ (7). Male Wistar rats (8 week) were purchased from Pasteur Institute of Iran. All animals were maintained at room temperature (22 ± 1°C) in a 12 hours light/dark cycle. All procedures were done according to the guidelines of the NIH Guide for the Care and Use of Laboratory Animals. After about 7 days of adaptation, the rats were randomly divided into six groups (n = 10/group); 1: control, 2: sham surgery, 3: sham surgery receiving normal saline; 4: Alzheimer’s rats (induced with Aβ 1 - 40); 5: Alzheimer’s rats + 8% VCO; 6: Alzheimer’s rats + 10% VCO. Aβ (1 - 40) peptide (Tocris Bioscience; UK) was dissolved PBS (10 µg in 10 µL of sterile PBS) and incubated at 37°C for 7 days to induce peptide aggregation. The aggregated Aβ and vehicle was injected slowly over 5 minutes into the left lateral ventricle of all animals in groups 4 to 6 as described in a previous study (8). One week after Aβ injection, 10% VCO and 8% VCO and were administered for 8 weeks. The hippocampus was homogenized in lysis buffer (Sigma-Aldrich; USA). All factors are presented as mg of protein of the hippocampus as determined by the Bradford method. The Catalase (CAT) and glutathione peroxidase (GPx) activity were determined using commercially available kits (BioLegend; UK) according to manufacturer instructions. The superoxide dismutase (SOD) activity in the hippocampus homogenate and serum were measured using a Randox kit. The activity was measured by determining the yellow anion formation from the reaction of the thiocholine generated by enzymatic hydrolysis of ATCh and Ellman's reagent. Briefly, ATCh (as a substrate, 75 mM), PBS (pH 8.0, 0.1 M), and 5,5’-dithiobis(2-nitrobenzoic acid) (Ellman's reagent, 10 mM) were mixed at a ratio of 2:150:5. The change in absorbance was measured at 412 nm for 3 minutes at regular intervals of 30 seconds using a UV-visible spectrophotometer immediately after the enzyme was obtained (10 µL) (9). TNF-α protein levels were determined using the rat TNF-α by enzyme-linked immunosorbent assay (ELISA) using commercial available kit (BioLegend). The concentrations of nitric oxide (NO) in the hippocampus homogenates measured according to previous published paper (10). Gene expression of TNF-α and iNOS mRNA was measured by real-time polymerase chain reaction (PCR). The total RNA was isolated from the hippocampus tissue using RNX-plus solution (Cinnagen; Iran). For cDNA synthesis, 2 µg of total RNA was reverse transcribed by using a cDNA reverse transcription kit (Thermo Scientific; Lithuania) (11). Gene expression assays were determined using real-time PCR (Roche; Germany) using Takara SYBR Master Mix (Shiga; Japan). The TNF-α primer sequences used were TNF-α (forward): TGTTCATCCGTTCTCTACCCA, TNF-α (reverse): CACTACTTCAGCGTCTCGT, iNOS (forward): AGAGACGCTTCTGAGGTTC, iNOS (reverse): TTGATGCTTGTGACTCTTAGG and GAPDH (housekeeping control, forward): AAGGTCGGTGTGAACGGATTTGG, GAPDH (reverse): TCCTGGAAGATGGTGA TGGGTT. The products of each gene were separated on 1% agarose gel and visualized using SYBER safe staining (10). The brain tissue was fixed by immersion in 4% paraformaldehyde solution. Hematoxylin-eosin (H&E), Imonohistochemistry (anti-tau ser404; Abcam) and Congo Red staning were done. The images were quantified in Image J software. All statistical analysis was done in SPSS software (version 20). The results from the histological counts are presented as percentage of control, whereas the data from the biochemical factors are expressed as mean ± SD. One-way analysis of variance (ANOVA) and Tukey’s post-test were used to compare the groups. A P value of less than 0.05 was considered significant. The TPC and TFC of the VCO were 60 mg GAE/100 g and 19 mg/100 g oil, respectively. The VCO exhibited potential DPPH radical scavenging activity (Figure 1A). At a 1 mm concentration, VCO showed substantial scavenging activity, similar to ascorbic acid and BHT. The significant antioxidant activity of VCO was determined by the FRAP method. VCO at a dose of 1 mg/mL had a FRAP value of 2.11 mmol/L, which is equivalent to FeSO4.7H2O and ascorbic acid showed 2.50 mmol/L. Figure 1. DPPH (1, 1-diphenyl-2-picrylhydrazyl) scavenging activity (A) of VCO. Levels of superoxide dismutase (SOD) (B), glutathione peroxidase (GPx) (C) and Catalase (D), and percentage of acetyl cholinesterase enzyme activity (E) in the studied groups. Results are presented as the mean ± SD (P < 0.05). ***P < 0.001, **P < 0.01 and compared with control group. ##P < 0. 01 and #P < 0.05 compared with Alzheimer group. Aβ significantly induced oxidative stress in the brain. SOD (P < 0.001), CAT (P < 0.01) and GPx (P < 0.001) activity decreased significantly in the Alzheimer’s group (Figure 1B - D). VCO had a significant effect on the treated rats. It elevated the SOD, CAT and GPx levels in the brain (P < 0.05). In this experiment, AChE activity in the brain as a cholinergic marker increased significantly in the animals receiving Aβ 1 - 40 (P < 0.001). Supplementation with 8% VCO (P < 0.05) and 10% VCO (P < 0.01) markedly attenuated AChE activity (Figure 1E). In the hippocampus, the TNF-α level increased in the Alzheimer’s group and was decreased by VCO. Intracellular TNF-α expression (Figure 2A) was markedly elevated in the Alzheimer’s group compared to the control group (P < 0.001). The VCO-treated animals showed a significant decrease in TNF-α expression level (P < 0.05). The TNF-α protein levels (Figure 2C) decreased significantly with the administration of 10% VCO (P < 0.01). Figure 2. Fold change of TNF-α (A) and iNOS (B) gene expression (normalized for glyceraldehyde 3-phosphate dehydrogenase [GAPDH]), TNF-α protein concentration (C) and hippocampus NO level (D) in the studied groups. Results are presented as the mean ± SD (P < 0.05). ***P < 0.001 compared with control group. ##P < 0.01 and #P < 0.05 compared with Alzheimer group. The effect of VCO on the iNOS gene expression (Figure 2B) and NO level (Figure 2D) in the hippocampus were investigated. The results showed that iNOS gene expression (P < 0.001) and NO levels increased significantly in the Alzheimer’s group. Increased doses of VCO markedly decreased both iNOS (P < 0.05) gene expression and NO (P < 0.01). Figure 3 shows that the accumulation of Aβ peptides in the hippocampus are a major factor in the progress of AD pathogenesis (1). Congo red staining was used to determine the Aβ peptide accumulation. Aβ1-40 injection into normal animals resulted in significant Aβ peptide accumulation (P < 0.001). VCO treatment markedly reduced Aβ plaque in the test rats (8% VCO; P < 0.05 and 10% VCO; P < 0.01) compared to those in the AD group. Figure 3. Brain histology after Congo Red staining. Staining the Congo Red was done to confirm the presence of amyloid plaque in the brain tissue (straight arrows) from control (A), vehicle (B), Alzheimer (C), Alzheimer + 8%VCO (D) and Alzheimer + 10% VCO (E) groups. Representative images of six sections per cortex and five brains per group were observed with × 20 objectives. Results are presented as the mean ± SD. ***P < 0.001, compared with control rats. ###P < 0.001 and ##P < 0.05 compared with Alzheimer rats. The presence of positive phosphorylated tau cells points to the formation of neurofibrillary tangles. The number of neurofibrillary tangles has a direct relation with the severity of AD. In this study, Aβ1-40 injection significantly increased the number of neurofibrillary tangles (P < 0.001) compared to normal animals. The administration of VCO reduced the number of positive cells (8% VCO; P < 0.05 and 10% VCO; P < 0.01) (Figure 4). Figure 4. Representative IHC stained brain sections from control (A), vehicle (B), Alzheimer (C), Alzheimer + 8% VCO (D), Alzheimer + 10% VCO (E) groups. Representative images of six sections per cortex and five brains per group were observed with × 40 objectives. The positive tau phosphorilated cells (straight arrows), was shown. Results are presented as the mean ± SD. ***P < 0.001 compared with control rats. ##P < 0.001 and #P < 0.05 compared with Alzheimer rats. Figure 5 shows the morphological changes in various areas of the hippocampus. The criteria used to determine damage or cell death were: darkened and small cells (cells with spots and dark membranes) and autolysis (cells showing unusual nuclear morphology). To assess the results, the number of normal and abnormal neurons were determined and the intact neurons were counted in the CA. The results showed that intact cell count decreased significantly in CA1, 3 and 4, but the change in CA2 was not significant. Figure 5. Representative H&E stained brain sections from control (A), vehicle (B), Alzheimer (C), Alzheimer + 8% VCO (D), Alzheimer + 10% VCO (E) groups. Representative images of six sections per hippocampus Ammon horn regions and five brains per group were observed with × 40 objective. The intact cells (red arrows), Autolysis (black arrows) and Darkened and small cells (withe arrows) was shown. Results are presented as the mean ± SD. ***P < 0.001 compared with control rats. ##P < 0.001 and #P< 0.05 compared with Alzheimer rats. The neuropathology of AD is complex and includes cerebral Aβ plaque accumulation, phosphorylated tau level, inflammatory reaction, increase in oxidative stress and change in AChE activity (1, 2, 12). Because AD progresses along several pathological or neurotoxic pathways, natural medicines with multitarget and multifunctional features can have strong nutraceutical and pharmaceutical influences on AD (3). 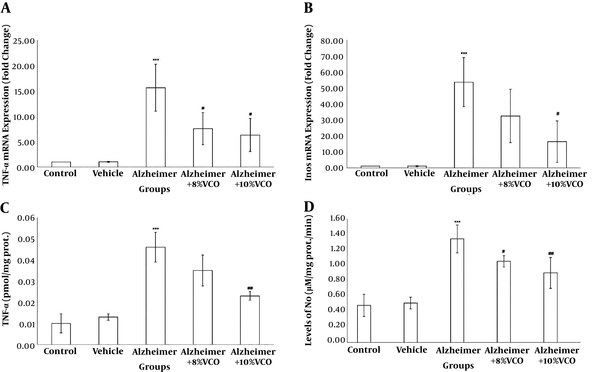 In this experiment, VCO exhibited potential nutraceutical and pharmaceutical effects through multitargeted pathways in Alzheimer’s animal models. In the present study, TNF-α gene expression and levels increased markedly after Aβ injection. Treatment with both doses of VCO reduced inflammation in the hippocampus of the AD group. Previous studies have also found that elevated inflammatory cytokines participate in the progression of AD (13). It also has been established that an increase in inflammatory factors, especially TNF-α, can increase disease progression because of its ability to induce neuronal Aβ production and facilitate amyloid accumulation (13, 14). 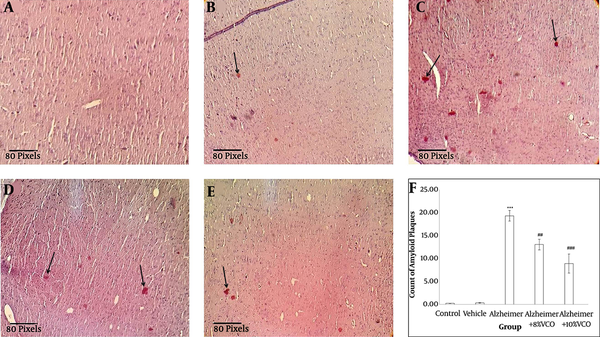 The results of this study showed that amyloid accumulation significantly reduced by VCO in the hippocampus according Congo red staining. Change of structure and function of hippocampus is known one of the earliest detectable traits of AD and is progressively documented as a main component of early AD pathology (9, 12). The results of the AD model using normal animals is in agreement with previous studies in showing that oxidative stress significantly increased in the rats. This can produce damage and death cell, along with Aβ accumulation, which is what occurs in AD (2). Furthermore, VCO supplementation significantly decreased oxidative stress markers in vitro and in vivo. It has been established that brain is more vulnerable to oxidative stress, probably because of the richness of iron, the high concentration of polyunsaturated fatty acids, the high rate of oxygen consumption and low antioxidant level. Antioxidant enzymes such as SOD, CAT and GPx form the main defense mechanisms against ROS (7, 15, 16). It has been established that an increase in oxidative stress markers and a significant decrease in antioxidant activity occurs the brain of AD subjects (15). The results of the present study shows that the level of CAT, SOD and GPx decreased significantly in the Alzheimer’s group and that treatment with VCO markedly normalized these markers. Because reduced antioxidant capacity is a part of normal aging and initiates very early in AD progression, natural antioxidants and free radical scavengers still hold promise for the management and prevention of various disease especially AD (17, 18). The current findings showed that AChE activity increased significantly in the AD group, whereas treatment with VCO significantly normalized it activity (19). It has been reported that Aβ accumulation decreases the AChE concentration in the AD brain by elevating AChE activity. Although cholinesterase inhibitors and similar medications are administrated to alleviate AD symptoms, most are toxic and have undesirable side effects (17). Previous studies have shown that VCO is very safe and has numerous beneficial health effects (4, 5). Previous studies have documented that synthesis of iNOS increased significantly after Aβ injection (20). This process may lead to a strong rise in the NO level in the hippocampus. It has been reported that iNOS/NO contributes to Aβ-induced neurotoxicity and may play a role in the pathogenesis of AD (21). In the current study, Aβ-stimulated iNOS production, but this was reversed by VCO. Interestingly, VCO normalized both iNOS expression and Aβ accumulation. In agreement with this findings, Tran et al. reported that NO overproduction participates in Aβ-induced brain injury and injection of Aβ1-40 increased iNOS mRNA expression (20). This study initially established that VCO treatment strongly attenuates damage to nerve cells. It was shown that TNF-α, iNOS, AChE and oxidative stress decreased markedly in the VCO-treated AD rats compared to the AD rats. These findings strongly suggest that VCO can potentially attenuate damage to nerve cells and improve AD pathogenesis by suppressing the inflammatory response. Authors' Contribution: Alireza Komaki is a head of the Department of Neurology Research Center, and has done a lot of experiment related to Alzheimer. On the other hand, the corresponding author has done various experiment related to neurological disorders. Fatemeh Mirzaei prepared first draft of manuscript and participated in animal handling, tissue preparation, biochemical factors analysis and gene expression. Alireza Komaki participated in animal handling (inducing Alzheimer), Mozafar Khazaei and Iraj Amiri did histological analysis. Cyrus Jalili prepared manuscript and involved in all methods. All authors have read and approve final version of manuscript. Conflict of Interests: It is not declared by authors. Ethical Approval: The overall process of research with animals was performed under the supervision of the Ethics Committee of Kermanshah University of Medical Sciences in line with the protocol of the Animal Ethics Committee (NIH Publication 80-23, 1996). Funding/Support: This research was supported by the Kermanshah University of Medical Sciences, Kermanshah, Iran. 1. Kocahan S, Dogan Z. Mechanisms of Alzheimer's disease pathogenesis and prevention: The brain, neural pathology, n-methyl-d-aspartate receptors, tau protein and other risk factors. Clin Psychopharmacol Neurosci. 2017;15(1):1-8. doi: 10.9758/cpn.2017.15.1.1. [PubMed: 28138104]. [PubMed Central: PMC5290713]. 2. Butterfield DA, Boyd-Kimball D. Oxidative stress, amyloid-beta peptide, and altered key molecular pathways in the pathogenesis and progression of alzheimer's disease. J Alzheimers Dis. 2018;62(3):1345-67. doi: 10.3233/JAD-170543. [PubMed: 29562527]. [PubMed Central: PMC5870019]. 3. Randino R, Grimaldi M, Persico M, De Santis A, Cini E, Cabri W, et al. Investigating the neuroprotective effects of turmeric extract: Structural interactions of beta-amyloid peptide with single curcuminoids. Sci Rep. 2016;6:38846. doi: 10.1038/srep38846. [PubMed: 28004737]. [PubMed Central: PMC5177957]. 4. Vysakh A, Ratheesh M, Rajmohanan TP, Pramod C, Premlal S, Girish kumar B, et al. Polyphenolics isolated from virgin coconut oil inhibits adjuvant induced arthritis in rats through antioxidant and anti-inflammatory action. Int Immunopharmacol. 2014;20(1):124-30. doi: 10.1016/j.intimp.2014.02.026. [PubMed: 24613207]. 5. Abujazia MA, Muhammad N, Shuid AN, Soelaiman IN. The effects of virgin coconut oil on bone oxidative status in ovariectomised rat. Evid Based Complement Alternat Med. 2012;2012:525079. doi: 10.1155/2012/525079. [PubMed: 22927879]. [PubMed Central: PMC3426286]. 6. Handayani R, Sulistyo J, Rahayu RD. Extraction of coconut oil (Cocos nucifera L.) through fermentation system. Biodiversitas J Biol Divers. 2009;10(3). doi: 10.13057/biodiv/d100309. 7. Oshaghi EA, Khodadadi I, Tavilani H, Goodarzi MT. Aqueous extract of anethum graveolens L. has potential antioxidant and antiglycation effects. Iran J Med Sci. 2016;41(4):328-33. [PubMed: 27365555]. [PubMed Central: PMC4912652]. 8. 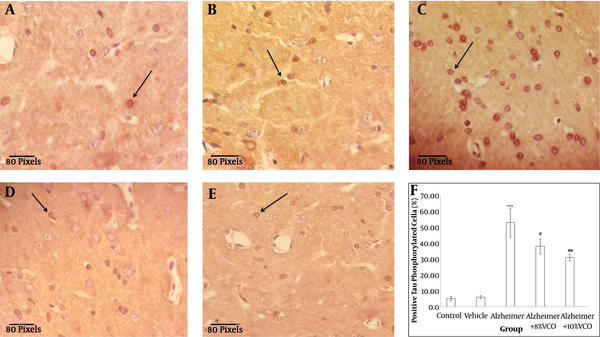 Mirzaei F, Khazaei M, Komaki A, Amiri I, Jalili C. Virgin coconut oil (VCO) by normalizing NLRP3 inflammasome showed potential neuroprotective effects in Amyloid-beta induced toxicity and high-fat diet fed rat. Food Chem Toxicol. 2018;118:68-83. doi: 10.1016/j.fct.2018.04.064. [PubMed: 29729307]. 9. Soodi M, Naghdi N, Hajimehdipoor H, Choopani S, Sahraei E. Memory-improving activity of Melissa officinalis extract in naive and scopolamine-treated rats. Res Pharm Sci. 2014;9(2):107-14. [PubMed: 25657779]. [PubMed Central: PMC4311288]. 10. Abbasi-Oshaghi E, Mirzaei F, Mirzaei A. Effects of ZnO nanoparticles on intestinal function and structure in normal/high fat diet-fed rats and Caco-2 cells. Nanomedicine (Lond). 2018;13(21):2791-816. doi: 10.2217/nnm-2018-0202. [PubMed: 30394178]. 11. Mohammadi A, Mirzaei F, Jamshidi M, Yari R, Pak S, Norouzian P, et al. Influence of flaxseed on lipid profiles and expression of LXRa, in intestine of diabetic rat. Int J Biol. 2013;5(4). doi: 10.5539/ijb.v5n4p23. 12. Li R, Yang L, Lindholm K, Konishi Y, Yue X, Hampel H, et al. Tumor necrosis factor death receptor signaling cascade is required for amyloid-beta protein-induced neuron death. J Neurosci. 2004;24(7):1760-71. doi: 10.1523/JNEUROSCI.4580-03.2004. [PubMed: 14973251]. 13. Swardfager W, Lanctot K, Rothenburg L, Wong A, Cappell J, Herrmann N. A meta-analysis of cytokines in Alzheimer's disease. Biol Psychiatry. 2010;68(10):930-41. doi: 10.1016/j.biopsych.2010.06.012. [PubMed: 20692646]. 14. Qiao X, Cummins DJ, Paul SM. Neuroinflammation-induced acceleration of amyloid deposition in the APPV717F transgenic mouse. Eur J Neurosci. 2001;14(3):474-82. doi: 10.1046/j.0953-816x.2001.01666.x. [PubMed: 11553297]. 15. Arimon M, Takeda S, Post KL, Svirsky S, Hyman BT, Berezovska O. Oxidative stress and lipid peroxidation are upstream of amyloid pathology. Neurobiol Dis. 2015;84:109-19. doi: 10.1016/j.nbd.2015.06.013. [PubMed: 26102023]. [PubMed Central: PMC4684986]. 16. Abbasi Oshaghi E, Goodarzi MT, Higgins V, Adeli K. Role of resveratrol in the management of insulin resistance and related conditions: Mechanism of action. Crit Rev Clin Lab Sci. 2017;54(4):267-93. doi: 10.1080/10408363.2017.1343274. [PubMed: 28704113]. 17. Farajdokht F, Amani M, Mirzaei Bavil F, Alihemmati A, Mohaddes G, Babri S. Troxerutin protects hippocampal neurons against amyloid beta-induced oxidative stress and apoptosis. EXCLI J. 2017;16:1081-9. doi: 10.17179/excli2017-526. [PubMed: 29285004]. [PubMed Central: PMC5735350]. 18. Goodarzi MT, Khodadadi I, Tavilani H, Abbasi Oshaghi E. The role of anethum graveolens L. (Dill) in the management of diabetes. J Trop Med. 2016;2016:1098916. doi: 10.1155/2016/1098916. [PubMed: 27829842]. [PubMed Central: PMC5088306]. 19. Papandreou MA, Tsachaki M, Efthimiopoulos S, Cordopatis P, Lamari FN, Margarity M. Memory enhancing effects of saffron in aged mice are correlated with antioxidant protection. Behav Brain Res. 2011;219(2):197-204. doi: 10.1016/j.bbr.2011.01.007. [PubMed: 21238492]. 20. 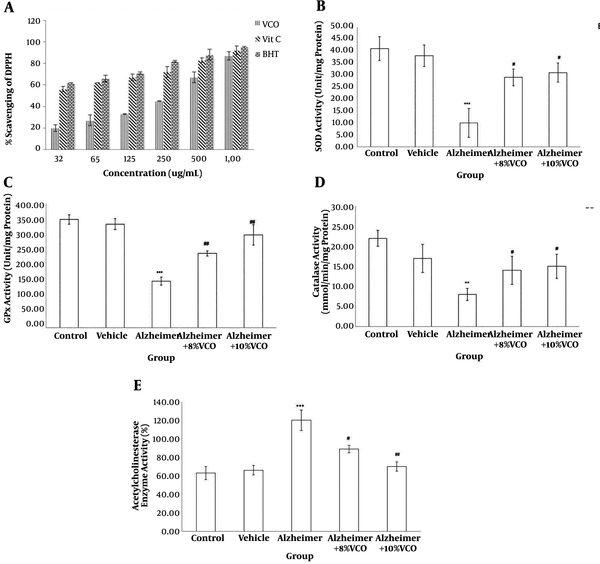 Tran MH, Yamada K, Olariu A, Mizuno M, Ren XH, Nabeshima T. Amyloid beta-peptide induces nitric oxide production in rat hippocampus: Association with cholinergic dysfunction and amelioration by inducible nitric oxide synthase inhibitors. FASEB J. 2001;15(8):1407-9. doi: 10.1096/fj.00-0719fje. [PubMed: 11387239]. 21. Liu H, Chen JP, Zhang WQ. [Inducible nitric oxide synthase induces beta-amyloid neurotoxicity in vivo]. Zhongguo Ying Yong Sheng Li Xue Za Zhi. 2002;18(4):329-32. Chinese. [PubMed: 21174802].